Take to the air in this week’s Retro Game of the Week! Ahhh the 90’s. Such a simpler time when it came to blowing up bad guys and flexing American military muscle. While video games have never shied away from mimicking real world military struggles, in 1992 Desert Strike practically slapped it into your face like a missile. 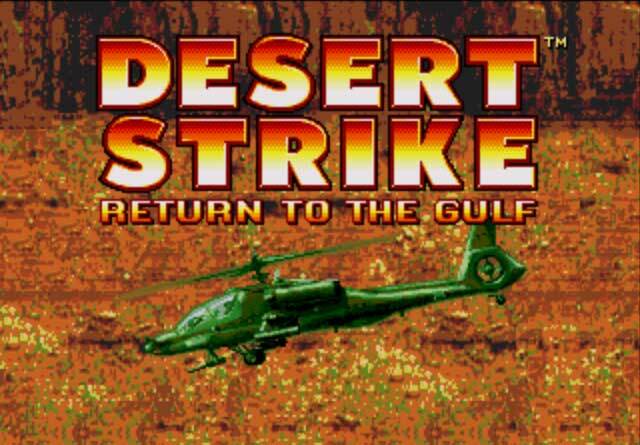 An isometric attack helicopter shoot em up, Desert Strike gave players a chance to dish up some American justice to an evil dictator of an middle-eastern country that looked a whole heck of a lot like Iraq. 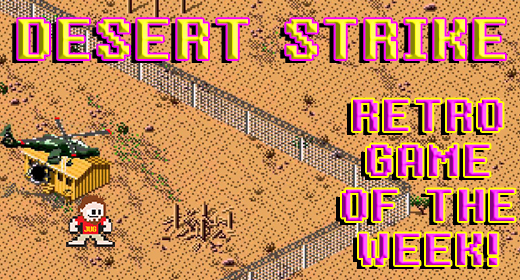 Desert Strike, taking many cues from the then very recent Desert Storm conflict, was a majorly impressive game when it blasted onto the Sega Genesis. The startling level of detail all of the individual sprites contained and the realistic colors made the desert battlegrounds look great. The plot had gamers piloting a lone chopper into a desert nation who had invaded a peaceful neighbor (sound familiar) to bring the the wrath of the free world. Not just a mindless shooter, each level tasked the player with specific objectives, and optional objectives, to complete before returning back to base. The choice was left to the player on what order to complete the objectives and how to go about doing them. The game’s isometric camera adequately gave a sense of how an attack chopper should move, and made dodging enemy artillery and missiles very hectic. The sound effects all sound great and make use of the Genesis’s somewhat limited audio hardware. Developed by a former mechanical engineer and a dentist (and all you thought they did was clean teeth), Desert Strike spawned a number of sequels across various platforms after it’s initial release. The later games may boast better graphics and (sometimes) more cohesive plots, there is something about the original that I like best. Maybe it just reminds me of a simpler time when politics and war weren’t so complicated and the good and bad guys were more clear cut. Or maybe I just like blowing up Saddam Hussein’s army over and over again. GO AMERICA! Desert Strike often finds itself listed on “Top Whatever” lists of Sega Genesis games and can be found pretty cheaply. I picked up a box copy at a flea market for five bucks. If your a Genesis fan, or just want to relive the glory days of Desert Storm, check Desert Strike out and have a rocking good time.